No matter what your specialty is or where you’re located, working a night shift as a nurse presents unique challenges. Often, the most difficult tests of these come from your own body, which wants nothing more than to lie down in your own bed when you’re working at 3 in the morning. Making it even more difficult is trying to balance a normal life outside of work with your opposing hours. You crave sleep while your family and friends are craving the chance to spend time with you. Appointments must be made to work around your erratic work schedule, and even your eating patterns are affected. Still, for decades, dedicated nurses around the world have made it happen and successfully. You can too by following these 13 tips from nurses who have conquered the night shift before you. If you’ve just been told that you’ll be starting on nights, help your body get prepared so long as time allows. Stay up as late as you possibly can, and begin trying different techniques to help you fall asleep during the day so that your body won’t go into a nightshift shock after your first shift. Think about the typical work day, where someone gets off at five and spends the next few hours taking care of life before getting to bed. If possible, try to schedule your life the same way, albeit a bit backward. Instead of jumping into bed the second you get home, have breakfast, clean the house, run your errands. If your shift doesn’t start until 11 at night, you can realistically stay up with most of the rest of the world until 2, and still give yourself 8 hours of sleep and 1 hour to get ready to start the process all over again. The bonus to scheduling sleep this way is that for about half of it, you are in bed after the sun goes down, just the way your body is programmed to be. Plus, you enter the workplace fully rested, rather than feeling drained from a whirlwind of activity just before making your first rounds. Eye masks, light blocking curtains, and earplugs can all help make it easier to fall into a deep sleep even when the sun is up and blazing. Make sure to keep the temperature in your room comfortable and have a strict “do not disturb” policy in place. That also means your cell phone, computer, and TV are all turned off until you are ready to rise again. If sleep eludes you during the day, consider taking up an activity like yoga to help you fall into a more relaxed state. If yoga is not your thing, a warm bath may do the trick, or get your partner to give your feet a massage. It is not enough that you nap, you have to provoke your body into falling into the deep sleep it needs to get fully rejuvenated. It’s tempting to have glass of wine or a cold one before bed, but alcohol inhibits the REM sleep you need. This means that you will not feel rested or even functional after waking up. Some may think that this will tire you out faster, but if you are able to kick start your metabolism with exercise before your shift, you will feel the positive effect for hours afterward. You can also take 20 minutes and get some exercise in at your midway point in order to make it to clocking out time. Caffeinated drinks are great for short-term boosts of energy, but they will cause a crash and burn effect. Limit coffee and soda during the shift and instead rely on foods that continually provide you with energy. Whole grains and proteins will help to give you steady energy rather than the peaks and falls that come from refined carbs and sugars. Grazing on nuts, dried fruits, and yogurts during lulls in the shift will keep your body energized and your eyes from falling shut. Not staying hydrated makes your body feel more run down than normal, depleting you of all of your energy. Bring along a large bottle of water to sip on during the entire shift. At the very least, the frequent bathroom breaks will help to keep you up. Not only will this make it more fun to pass the night away, it will be crucial for patient care. 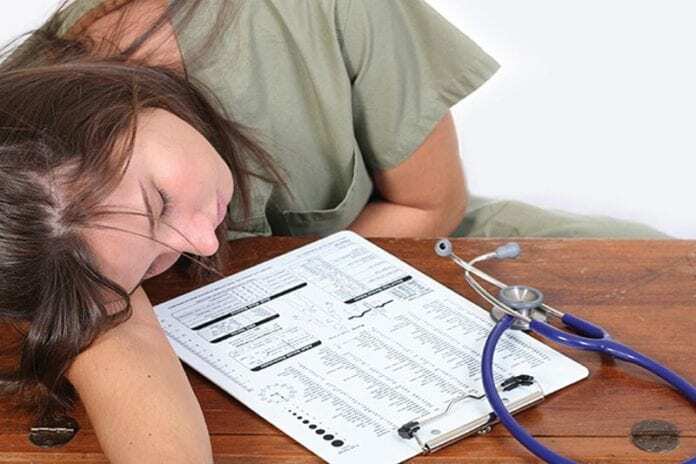 With fewer senior staff members on the floor during the night shift, nurses have to learn how to rely more on their own skills – and those of their peers – when a critical situation arises. Spend free time getting to know the people working with you, and in building a foundation of camaraderie and trust. One of the issues that makes a night shift so daunting is that sometimes there is a lack of work to be done. Patients are sleeping (hopefully), leaving not much to do beyond keeping an eye on their vitals. Get in the habit of finding ways to make the time with constructive busy work like updating charts, organizing storage areas, or even taking inventory of supplies. Not only will it make the time fly, but the day shift nurses will be eternally grateful for the help. Another constructive way to make use of slow periods on a night shift is to study the latest nursing trends or techniques. You can also use this time to broaden your career opportunities by learning a new specialty. Don’t spend your coveted time off wrapped up in bed, or you will begin to feel resentful of having no life outside of work. Make plans with your family, go and visit friends, or spend some time working at your favorite hobby. With careful planning, you can still enjoy your time off and not throw your body’s sleep rhythm too far out of whack. It is not uncommon to find nurses who have learned to love the serenity of nightshifts. With the right attitude and plan in place, it can become one of your favorite shifts to work too. Working in a busy unit, night shift for me doesn’t have many slow periods. I’m lucky to get a bathroom break, let alone lunch. I have an hour and a half commute, so getting 8 hours of sleep is unrealistic for me. If I grab 5 hours uninterrupted, that is awesome. However, is not usually the case. I don’t always get the same 3 days scheduled,and as everyone well knows, real life revolves around 9-5 hours. Not very conducive to a night shifter. Great tips, though. Days off, I try to live in the daytime and sleep when my family sleeps. Night shift work is draining, but many of our situations at home dictate our choice for this shift. We all know it is not the healthiest shift, but without night hours, the job would not have success!! I too did the night shift for almost 15 yrs,but the shift was 7p-7a. Since I worked ICU/CCU,there were very few slow times,so by the time I got home and tried to wind down,it was 9 am. But I got my bed in my dark,cool room with soft music to help drown out daytime noise,and believe me,I slept sound till 5 pm,got up and started all over again. I was very fortunate to have a husband who took over with our 2 kids while I slept. Since I worked only 3 nights a week,And he was a firefighter working 24 on/48 off,we arranged my schedule according to our parenting needs. I was so lucky to work at hospital that even In the 1980s,cared about their nurses enough to make sure their work life and home life presented very little conflict,and patient care was so much better for it. Happy nurses,happy healthier,patients! I worked nights for 15 years with 6 and then 7 children. I was able to participate in school activities, like PTA evening meetings. I was able to ferry my children to soccer practice, baseball, swimming, etc. I did go to bed as soon as I got home because they were in school, or one (4 yo) was able to stay home if I didn’t have to go back to work that night, and she was able to keep herself amused without getting into trouble until around 1:00 when she would come snuggle with me until the older kids started coming home from school. Then I got up, and started my day. After they went to bed around 8 -9, my husband and I would have our time together and around 1000 I would shower and dress for my shift. It worked for me. I did work with a lot of nurses who never seemed to sleep. I could not do that. My body shut down by 0900 and I would chill and start to shake. Thank you so much for this article. I am a brand new nurse. I was hired to work during night shifts. These tips should really help me deal with my new nocturnal lifestyle.